A four-point-one magnitude earthquake struck off the southeastern city of Pohang on Sunday. 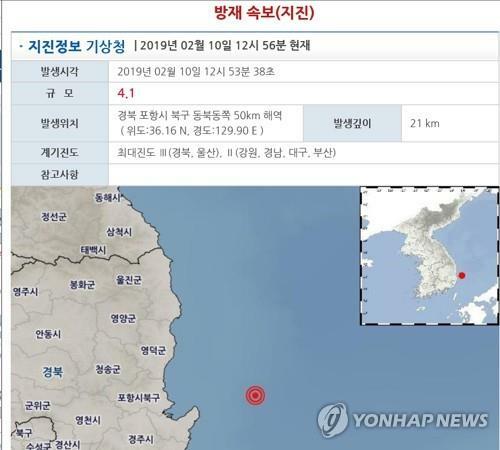 The Korea Meteorological Administration said that the quake took place at 12:53 p.m. in waters 50 kilometers east-northeast of the port city at a depth of 21 kilometers. The KMA had earlier announced the quake's magnitude was four but later revised it. A KMA official said that it is a quake-prone region, but the magnitude is larger than usual, adding there have been no reports of damage received so far as the location is about 50 kilometers off the coast. It is the first time that a quake with magnitude of four or larger occurred in the country since February 11, 2018 when a four-point-six magnitude quake took place five kilometers northwest of Pohang City's Buk district.